I am soooo glad it's Friday, this has been one long work week! I am still finishing up Valentine card orders and have been working non-stop to get those finished so I can move on to some other projects and DT duties I need to get to. Here is another favorite color combo of mine that I don't use near enough........Pumpkin Pie, Taken with Teal and Cool Caribbean - of course I had to add a splash of Tres Jolie DP. 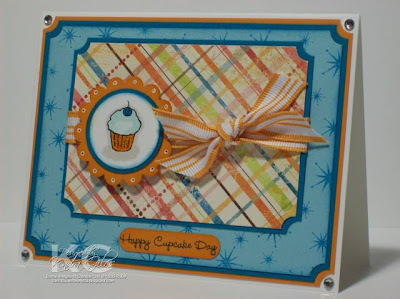 I needed to make a few birthday cards and pulled out my MFT Icing on the Cake set - love, love, love this cupcake image and yeah that "starburst" background image is another one of my faves! Don't forget about the new release party in the Gina K. Designs Forum on SCS this Sunday evening between 7-10 central. You won't want to miss all the new goodies because they are TDF!!! Accessories: Copic Markers, Ticket Corner Punch, Scallop Circle Punch, Circle Punches, SU! Striped Grosgrain Ribbon, Word Window Punch, Dimensionals and Gemstones. LOVE these colors together Kendra! So Cute! Beautiful card. Those colors are so warm & happy! This is great, Love the paper. Very cute card for birthdays and I love the colours. You always have such great colour combo's - where do you get the inspiration from? Do you keep a list of great colour combo's? I love this color combo too! Great card, Kendra! So bright and cheery! By the way! Congrats on Take Ten. I was at HL yesterday and was thumbing through their February issue and saw one of your cards posted. I LOVE cupcakes!! So Sweet! I have left something sweet for you on my blog!! Love the colors; so out of my comfort zone; but you make them look spectacular!! How stinkin' SWEET! Love it, Kendra! Hope you're enjoying your weekend! Love this card!! How adorable! This is really a wonderful card! Have a good weekend. Hey Kendra! This card is adorable! I really like it! 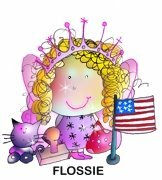 I also wanted to mention that I added you to my blog links! :D I just love checking your site! I love your color combo's. Your cards always say wow! Love the color combo.... way to go..your blog is awesome. Fun colors. Love the card! cool card. love the colors! Love the paper you used!